A career as a Certified Nurse Assistant (CNA) is a great option for anyone who would like to launch a career in health in the shortest possible time. The profession is especially appealing to prospective nurses who would like to test the waters before enrolling in a two or four-year degree program. CNAs work under the direction of a licensed practical nurse or registered nurse to attend to the daily physical and health care needs of patients. They assist patients or residents who are unable to help themselves with personal care, grooming, mobility, and feeding. 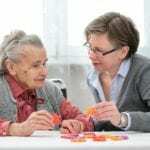 New Jersey nursing assistants must complete the state appointed curriculum for a Nurse Aide in Long Term Care Facilities and the Competency Evaluation Program. Those who complete the NATCEP will be added to the Nurse Aide Registry and will be certified to practice in long-term care facilities where demand is high for skills direct care professionals. The duties of a CNA vary from one setting to another. General duties include gathering vital information about the patient’s state of mind and medical condition, maintaining a safe environment, and meeting the basic needs of residents. Healthcare Training Institute prepares adults for a career as a nursing assistant with the approved of the State of NJ. The curriculum follows all the guidelines set forth by the Department of Health and Senior Services. It delivers 90 hours of instruction: 50 hours in the classroom and 40 hours in a long-term care facility. Of the clinical instruction, 16 hours will focus on infection control, communication and interpersonal skills, resident independence and rights, and safety and emergency procedures. Areas of study include the aging process, emotional needs and support, lifting and moving techniques, personal care and grooming, specimen collection, ambulation, signs and symptoms of common disorders, taking vital signs, and measuring fluid intake and output. Other topics include the role of the nurse in postmortem care and death and dying. Instructors emphasize the basic knowledge and skills need to provide optimal care to residents of long-term care facilities. Day and evening classes are available. Day classes meet Monday through Thursday from 8:15 am to 2:45 pm. Evening classes meet Monday through Thursday from 6:00 pm to 9:30 pm. Both schedules run for 2 months. A 3-month weekend schedule may also be available. Submit an application form with the $25 application fee and $75 registration fee. Tuition costs $980. Registration is $150. Ace Healthcare Training Institute’s CNA program helps adults develop the skills to meet the physical, psychological, and physiological needs of residents in long-term care facilities. The Department of Health and Senior Services course comprises of 90 hours classroom and clinical hours to fit students for entry-level employment in the healthcare industry. Course topics include role and responsibilities of a nursing assistant, vital signs, infection control, observation and reporting, nutrition and feeding, elimination, personal care and hygiene, emergency care, death and dying, Alzheimer’s care, range of motion, and much more. Two class options are available. Day classes meet Tuesday through Friday from 9:00 am to 2:00 pm for 4 weeks. Evening classes meet Tuesday through Friday from 5:00 pm to 8:30 pm for 4 weeks. Interested persons must review the prerequisites and documentation requirements, visit the campus, and submit an application via mail or in person. Pay the registration fee ($200) at least five days before the first class. The nursing assistant program at HPI School of Allied Health is approved by the State of New Jersey and gives students the knowledge and competencies to assume the role of the nurse aide in an interdisciplinary healthcare setting. The curriculum meets and exceeds the guidelines for the training of adults for nurse aide certification in the state. Experienced instructors introduce students to the concepts of rehabilitative and restorative care, prevention of infection, professionalism, disease processes, safety and emergency procedures, law and ethical behavior, communication, basic nursing skills, and observation and reporting. Students must participate in a clinical experience, which will provide the opportunity to care for patients in a long-term care facility. Attend an interview with an admissions officer. The duration of the program is 6 weeks. Graduates will be eligible for certification after completion of state certification exam. Humane Concepts Healthcare Training prepares students for certification in New Jersey in just 4 weeks. The 90-hour course includes lectures, practical sessions in a simulated lab, and a supervised clinical experience in a long-term care facility. Graduates are eligible to take state certification exam for nurse aides to be added to the New Jersey Nurse Aide Registry. Students will learn basic nursing skills, the role of the nurse aide, personal care, communication and interpersonal skills, infection control, safety and emergency procedures, and rehabilitative treatments. Applicants must be 18 years or older, demonstrate English competency, complete a TB test and a physical exam, and be physically capable of completing the tasks of a nurse aide. Tuition is affordable and may be financed through a flexible payment plan or sponsorship from employers. Scholarships may be available for low-income or unemployed applicants. Admission to the nursing assistant program at Workforce Advantage requires a demonstration of a fifth-grade reading level and criminal background clearance. Applicants must register for the pre-admission TABE test. The curriculum is approved by the State of New Jersey, and graduates are eligible to take the state competency evaluation to be added to the Nurse Aide Registry. Through long-standing partnerships, students are able to participate in a supervised clinical experience and secure employment with major employers. Instructors take the learner driven approach that will give students the confidence in patient care as they practice their skills in a modern lab and approved long-term care facility. Practical experiences reinforce the concepts learned in the classroom and guarantee students’ success on the competency exam. Job coaching is a major part of the training to help students transition from the classroom to the world of work. Contact Workforce Advantage to find out more about scholarship opportunities for eligible students. The nursing assistant program at Branford Institute prepares students for a career in healthcare in just 5 to 6 weeks. The program is approved by the New Jersey Department of Health and Human Services so graduates are eligible to sit the licensing written and skills exam to be added to the Nurse Aide Registry. Students attend lectures in the classroom and participate in direct patient care opportunities in a skilled nursing facility and under the supervision of a licensed nurse. They acquire basic nursing skills to care for patients in long-term or acute care settings. Course topics such and personal care and grooming, vital signs, ambulation, positioning, feeding and nutrition, anatomy and physiology, aging, communication, infection control, rehabilitation and restoration, dementia, and safety and emergency procedures prepare students to meet the needs of residents while respecting their privacy and rights. Day and evening classes are available. Classes meet Monday through Thursday from 9:00 am to 2:00 pm or from 5:00 pm to 8:30 pm. Financial aid may be available for eligible students. Address: 570 North Broad Street, Elizabeth NJ 07208. E & S Academy’s CNA course gives students the opportunity to acquire up-to-date information and develop the skills necessary to function in the role of a Certified Nursing Assistant. Instructors emphasize the attitudes and concepts that are essential for success in the profession. The curriculum includes classroom and clinical experiences that focus on disease processes, infection control, data collection, psycho social care, hygiene, law and ethics, nutrition, and mental health. It covers a total of 90 hours: 50 hours in the classroom and 40 hours in a state licensed long-term care facility. E & S Academy offers flexible payment plans that will let students pay their tuition in small, manageable payments.